A few months ago, J.C. Little, The Animated Woman, wrote a post about how much her family has bonded over washing dishes together. And I thought briefly about washing the dishes with my kids. J.C. made it sound so tactile and engaging, so warm and sudsy. And I recalled doing dishes with my stepmom, talking. But I also remembered reaching into the cool-ish, dirty water to fish out whatever was on the bottom: slime, forks, or a sharp knife. 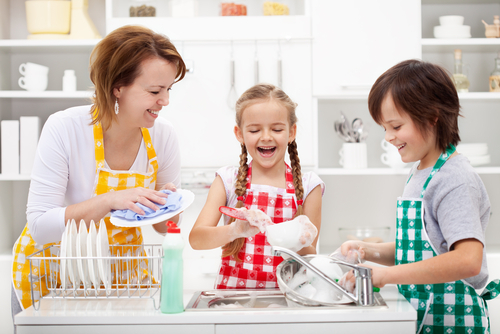 This is totally me and my two kids dressed in matching aprons and laughing as we wash perfectly clean dishes in a perfectly clean kitchen. But her post gave me an idea. Six days before I read that lovely post about family bonding over dishes, my sometimes-washer-of-dishes moved to another house. So I’d been doing 100% more dishes by myself for a few days. And I didn’t like it. Not that washing dishes is a big deal. But when you have extremely limited time, most of which is crammed with paid and unpaid activities promised to someone else, washing dishes is a big ol’ “seriously, would paper plates really ruin the world if I used them just until I submit the next big project?” tirade of justifications and pouts while scraping preschooler rejects into the compost. So the next morning I asked my eight-year-old Peanut to empty the dishwasher, please. He shrugged and emptied the whole thing. It was the first time I’d asked him to this, but he’s an enormously bright boy and member of the family and has thus experienced the acquisition of clean dishes from cupboards. He could therefore extrapolate the placement of clean dishes in the same cupboards. [May that be proof, some day, when his partner claims he ‘doesn’t know where anything goes.’] The next time I asked, four-year-old Butter clamored to help. He’s big on helping. And they got along, doing the job I rather hate, while I made dinner near them. We were all in the kitchen, excited, mobile, talking, and thanking each other for various tasks that helped the family. Peanut even devised the most brilliant plan, ever: put all the forks in one compartment of the silverware basket, spoons in another, and so on. That way, he pointed out, when we empty we can grab a whole section and just dump it into the right section of the drawer. I marveled at his genius. And I refrained from telling him I’d heard of this maniacally organized plan for dishwasher loading but could never bring myself to spend that much energy on organization of dirty silverware. So we ooh and aah over the boy’s idea, we listen to his argument about the finer points of his plan, and we do it his way. And now he thinks he’s the King of the family. Wait a minute, here, J.C.! Turns out this trick works even if you *have* a dishwasher! I’d always said before I had kids that I’d have them do their share of chores. But as their dad and I bickered about who did the dishes, it never occurred to us to farm out that job. We bickered about how and when to put the laundry away, too. So I decided to J.C. this activity, too. After the dishes and breakfast, entering the second week of our new family arrangement, I plopped a basket of laundry on the boys’ floor and asked them to find their stuff and put it away. Again with the together and the talking and the many hands making light work. It’s been almost three months. And my kids are emptying and filling the dishwasher every day. And putting away every load of laundry. And they’re doing it together, while I do something else domestic in the same room. Usually cooking or sweeping. Man, I love me some sweeping. Watch everything that’s wrong with your life gather in a pile, nudge it onto a dustpan, and throw it away forever. Then do it again in three hours because, geez, do these kids grow sand and dirt and…what is that, a twig?…out of their socks? This is not my child. Or my sand. Or my broom. Or my background. 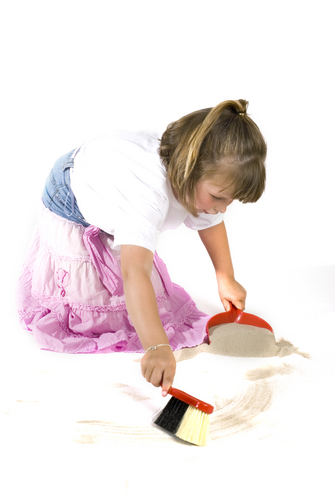 Do you know how bad stock photos of sweeping are? Shameful. Forcing my kids Working together to do chores feels good. It feels even better to get the work done more quickly and with less fighting. This entry was posted in Child Wrangling, Feels like home, Relationships. Bookmark the permalink. ← We can do it. I love the idea of bonding over dishes. My daughter is only 1 and I’m already thinking about to get her high enough to see the counter safely. Oh, toddlers and warm soapy water is *magic*! If you have a double sink, put her in one side and fill the other side with the water. She’ll get drenched even though you’re standing there the whole time, but have fun. My mother-in-law usually does the dishes when she’s home, which is about half the time. We don’t have a dishwasher, so they’re all handwashed. When I do them, I always wash the silverware in threes, and I always do it with three of the same (three spoons, three forks, etc. ), and then put them in the same compartment of the dish drainer. So when it’s emptied, the silverware doesn’t have to be sorted. My MiL thinks I’m crazy OCD, which may be true, but it has its benefits. One of my ongoing dreams is to one day have a dishwasher. Preferably before this coming third child is old enough to eat solid food and thereby dirty several dozen pieces of china and cutlery in a day, like his siblings do. Three adults and three kids will make a LOT of dishes. Even with five of us, the dishes pile up alarmingly. Fantastic. I love how you allowed Peanut to own the dishwasher unloading plan. He’s a problem solver. PS. Draw that sweeping image. He *is* a problem solver. Known and proven fact. You draw an elf sweeping and I’ll properly attribute it. I have ventured to let my older daughter rinse the dishes, which of course water ends up everywhere, but she loves it. So who am I to argue? One day she can take over, as I’d gladly hand those duties over any day! Great post. Ah, yes, the Holy Grail of them taking over. I fantasize about that some times. Sweeping and mopping, adorable teenagers, talking about their feelings and future plans. So much more pleasant to do a family task if someone else does another of the family tasks. Otherwise shopping and planning and preparing and cooking and dishing and cleaning and washing and tidying and putting away makes being a family a chore for one person, and a party for everyone else. We don’t have to do it all, D.A.